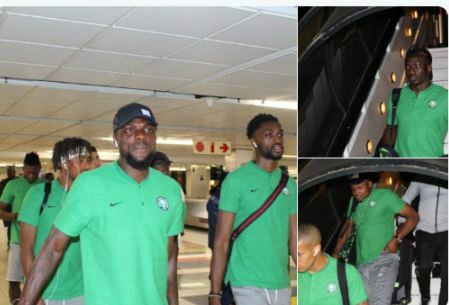 The Super Eagles have arrived in Johannesburg for the 2019 Africa Cup of Nations (AFCON) qualification game against South Africa. The team touched down at OR Tambo International Airport at about 3:30am on Friday. The chartered aircraft which took off from Asaba, Delta, had a stop-over in Luanda, Angola. While in South Africa, the Super Eagles will lodge at Park Hotel, Sandton. The Super Eagles will have a feel of the FNB Stadium this afternoon. After tomorrow’s game, the team will return to Asaba immediately to begin preparation for Tuesday’s international friendly match against Uganda. However, before the match against Uganda, some of Nigeria’s finest retired players will take to the Stephen Keshi pitch to take on a home-based selection in a friendly game. The players, including Victor Ikpeba, Bright Omokaro, Victor Agali, Edema Fuludu and Joseph Yobo will play in that game. 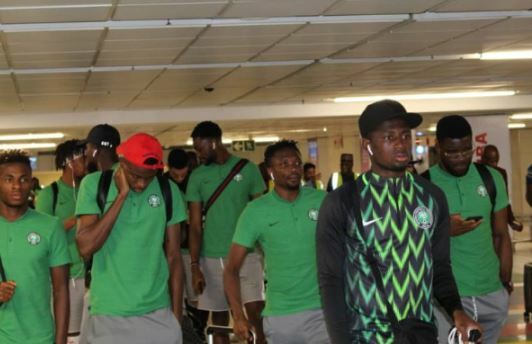 Other former international players expected to feature in the encounter are Mutiu Adepoju, Yisa Shofoluwe, Ike Shorunmu, Ifeanyi Udeze, Kenneth Nwaomucha, Kingsley Obiekwu, Friday Ejedegba, Ezeji Victor and Henry Nwosu, who will serve as the team manager. Players in the home-based team are Christian Eze Nduka, Tosan Blackson, Sunny Osunde, Francis Okolo, Henry Dittimiya, Humphrey Jebba and Joe Cole.